Michelle Tolini Finamore is the Curator of Fashion Arts at the Museum of Fine Arts, Boston and has her Ph.D. in the history of decorative arts, design and material culture from the Bard Graduate Center in New York City. 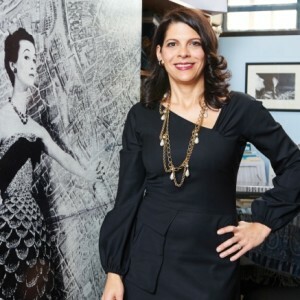 She has worked in a curatorial capacity at a number of major museums, including the Costume Institute at the Metropolitan Museum of Art, and as a fashion specialist at Sotheby’s auction house. She has curated a range of exhibitions including; #techstyle, Think Pink,and Hollywood Glamour: Fashion & Jewelry from the Silver Screen at the Museum of Fine Arts, Boston, Cocktail Culture at the Norton Museum of Art; Driving Fashion: Automobile Upholstery from the 1950s at the Museum at FIT; and assisted Hamish Bowles with Jacqueline Kennedy: The White House Years at the Metropolitan Museum of Art. She has taught courses on fashion, design, and film history at the Rhode Island School of Design and Massachusetts College of Art. She most recently authored Gaetano Savini: The Man Who Was Brioni (Assouline, 2015) Hollywood Before Glamour: Fashion in American Silent Film (Palgrave, 2013) and co-authored a book on the history of studio jewelry, Jewelry by Artists: In the Studio, 1940-2000 (Museum of Fine Arts, Boston, 2010). Finamore has lectured widely and written numerous articles for both the scholarly and popular press, including Fashion Theory, Architecture Boston, and Gastronomica.